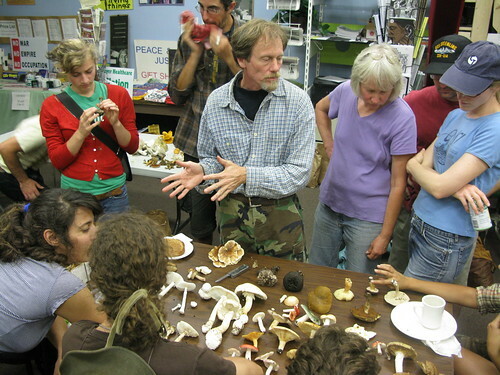 Sharing your knowledge, talents, skills, and interests with the community via the Ithaca Freeskool is easy. Meet new people and make Ithaca more knowledgeable about things that you find fun and/or important. Got an already existing free event? Put it on the Freeskool calendar and bask in the free advertising! Freeskool is decentralized non-institutional project. In other words, you and I make it happen. Therefore, you have certain responsibilities as a teacher. Promote your class through word-of-mouth, flyering, community outreach, and online. Work with other freeskoolers to post calendars and flyers. Be prompt and reliable. Keep in touch with students. And take good care of the spaces that host your class. Most importantly, be open to others’ ideas and beliefs… be respectful. We will not accept any racist, sexist, classist, or hetero-sexist proposals. Thanks! Each semester is 3 months long, and there are 4 semesters per year. You choose how often in that three months you want to teach your class and what days work for you. Single-session classes are just fine if you prefer to teach stand-alone workshops. You can check with us (in advance of the proposal deadline, please) to try to avoid conflicts. Classes can take place anywhere – people’s homes, public parks, local businesses, etc. For a list of spaces that welcome classes click here. You can download a PDF directory of all the available meeting spaces in Tompkins County from the Human Services Coalition website. If you’re having trouble, get in touch with us and we’ll if we can help. All the classes will be listed on this site and distributed in printed calendars around the community, but you can take additional steps to get the word out. Be strategic – you probably have limited time, so focus your efforts on reaching the people who would be most interested in your class. Sometimes all you need is word of mouth. Or to reach a broad audience you could make a Facebook event page, put up eye-catching flyers around town, send an event blurb to email lists, and even contact local newspapers and other media outlets. It helps to start a buzz a few weeks before your class, and then send a reminder a day or two before the event. I’m interested in facilitating a class that involves audio interviewing techniques for radio broadcast followed by learning audio editing utilizing shortcut editors (have 6 stations). Final product would be to PSAs and a 30 minute edited topical radio presentation. I think the class would be limited to 12 students but would be offered every term. This class would be in collaboration with ICR. I responded to you via email, through the email listed at teen talk NY. thanks! Thanks Gloria and Ryan… re: Interviewing techniques and Shortcut Editor 360 editing… we’ll set it up to begin in Oct. I also want to set up a veterans’ writing group… both poetry and prose. I would like to have an organizing meeting on Aug 24th and then meet 2 x monthly beginning in Sept. We will collaborate with Post Traumatic Press (.org) which publishes veterans’ writings (editor Dale Wise – 1st CAV Recon). Jim, I would very much like to be involved in your class and ICR, but the email address on your site seems to be defunct and I don’t see you on the new calender (unless I’m mistaken?) How can I participate in any of those subjects? The new calendar (2nd edition or later) has the class information for Jim’s class. You can go to the calendar page and download the PDF of the document to see this info. while in portland oregon i facilitated a freeskool class on d.i.y. sustainability. the concept behind this is basically simple; what can we do to free ourselves from buying expensive things to make our lives more “green”. it was a lot of fun and many people brought their ideas to make it happen, including building bike carts, making incense, growing mushrooms, solar cooking, “recycled” gardens (probably not what you think), gorilla gardening, making our own instruments, power from a potato…………the list is inexaustible. If you want to submit such a class for the next Freeskool session, please make a listing and send it to us at ithaca_freeskool@riseup.net. Include your class name, your name, contact information, dates and times, location(s), a solid, brief, description, and requirements for students (any books, equipment, need to RSVP, etc). I am thinking of submitting a proposal to host a skillshare/ideashare on urban gardening for this next session. Has anything similar been proposed? What do you think? I realize that time is getting short! Hi Gail, thanks for your comment! I saw an email from you answered by Lily so I’m guessing you’ve got this figured out. Please do submit your class – it sounds like a great idea!